Escape to the era of Downton Abbey and experience all the drama of World War 1 alongside literature’s iconic Elizabeth Bennet &amp; Fitzwilliam Darcy. You’ll watch their tender love unfold as they learn to work together and reconcile their differences amidst the carnage of war. •Cameo appearance by John Thornton (of Gaskill’s North & South). •Rated PG. Clean romance, mild language, some war scenes. 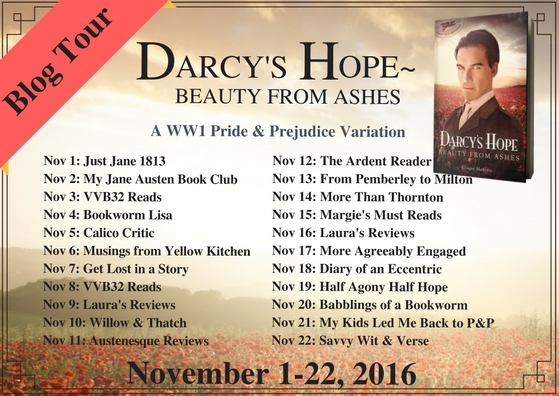 • Darcy’s Hope has a happy ending but will continue in Darcy’s Hope at Donwell Abbey, coming in February 2017. In the sequel, readers will experience the full resolution of the mystery, and our beloved couple’s love will face a new, tragic test. A week later Elizabeth quickened her pace to the overlook, anxious to read the letter from Jane. She settled in her favourite spot, leaning against a sprawling oak with a magnificent view of the canal below. Lieutenant Bingley had been back in Boulogne for nearly a week, so surely there would be news. Scanning the letter Elizabeth squealed in delight. A wedding—next week! And Jane begged that she come. So soon? 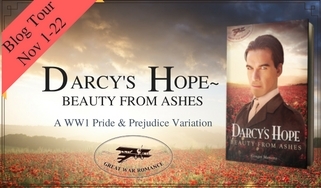 Oh, but did Charles have to ask Darcy to stand up with him? Elizabeth grunted. Could she not go anywhere and be away from the man? Even the wedding date was chosen to coincide with the captain’s meeting in Boulogne to ensure his presence. 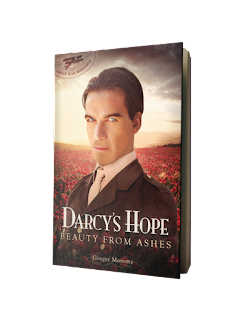 Why in the world would Charles, who must have plenty of friends, pick sour-grapes Darcy? Could The Yank be right? Could the captain’s time in the trenches and his losses at the Somme have profoundly affected him? She often heard horror stories of things soldiers had seen and experienced that left them numb. She huffed under her breath. 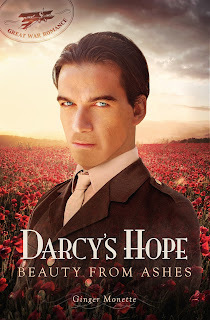 Certainly that was not the case with Captain Darcy. He was stone cold by nature with an impenetrable heart—no—he told her once he loved her. And that first day she nursed him, he kindly consoled her about her mother and sister. There must be something beating in that broad chest of his. What difference did it make? She shook off the thoughts as she refolded Jane’s letter. 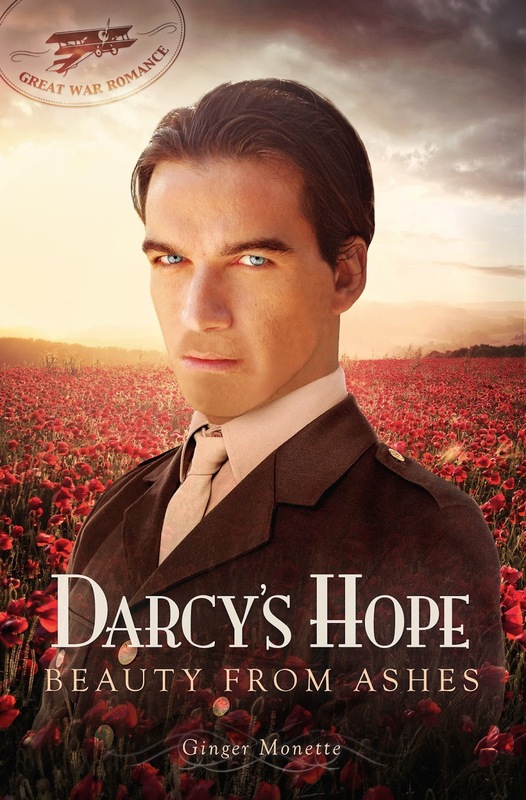 Darcy had ruined her family, and she wanted nothing to do with him. “Don’t shoot!” Elizabeth cried, pleading her hands in surrender. It was Captain Darcy. She opened her mouth, then shut it, dumbfounded. Was it possible he had an explanation? She stayed an extra two weeks with Charlotte after the captain’s departure, but surely had a letter arrived at Longbourn, it would have been left with her other correspondence. Wouldn’t it? He released a defeated sigh and broke the silence. “Although I no longer adhere to my principle that my good opinion once lost is lost forever, I suppose I cannot fault you for abiding by it. Good day, Miss Bennet.” He turned on his heel and strode away. Elizabeth stepped back, wilting as she released a breath. Why did every encounter with him leave her breathless and weak-kneed? The tension that radiated between them was unlike anything she’d experienced before. It was somehow entrancing—both repelling and tantalising at the same time. She headed towards the chateau and shook off the thoughts, not wanting to think on it any more. ...it is no wonder your father gave up on your sisters and retreated... She winced at the grain of truth. But she wasn’t the obstinate one, her sisters were. She huffed at his presumptuousness. What made him such an expert on everything? She’d never seen anyone out here except the children who played with her stuffed dog, an occasional wagon on the road, or Sapper and his men at the cemetery. Under the captain’s authority, she’d already surrendered the dowager house and the annexe. She had no intention of following his every whim as if he were an omniscient god. Besides, what was he doing out here gazing down the canal? Didn’t he go to the ward at the school every day? Ah, our dear couple, always plagued by distrust and misunderstandings. But indeed what was Darcy doing at the canal? And why didn’t Elizabeth receive his letter? You’ll have to read the story to find out! 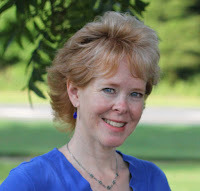 Her WW1 flash fiction piece, Flanders Field of Grey, won Charlotte Mecklenburg Library’s 2015 Picture This grand prize. Ginger lives in Charlotte, North Carolina, where she happily resides with her husband, three teenagers, and two loyal dogs. 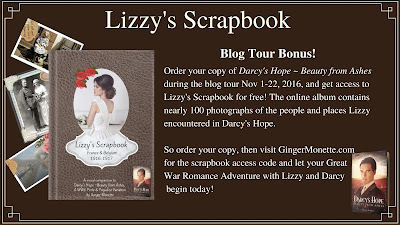 If you buy the book during the course of the blog tour you can access ‘Lizzy’s Scrapbook’ for free. See the graphic below for details. As Darcy’s Hope is set during the era of Downton Abbey and the tour is taking place in the run up to Christmas, Ginger is offering a giveaway along those lines. 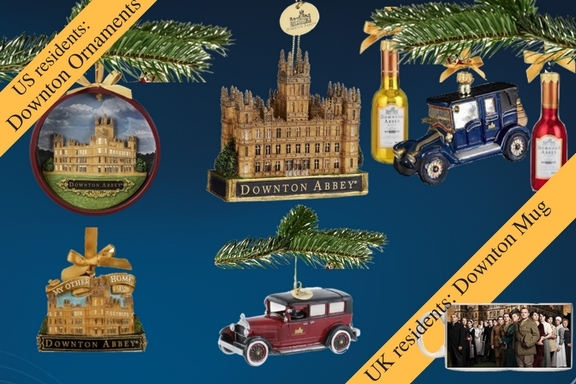 There are seven Christmas tree decorations to win for those of you in the continental US, and a Downton Abbey mug for UK entrants. To enter, use the Rafflecopter. Thank you so much to Ginger for stopping by with news of her new book, and offering such a fun giveaway! It's quite a ride. Enjoy! Yes, definitely take it as a sign! Thank you, Ceri, for such a lovely post! 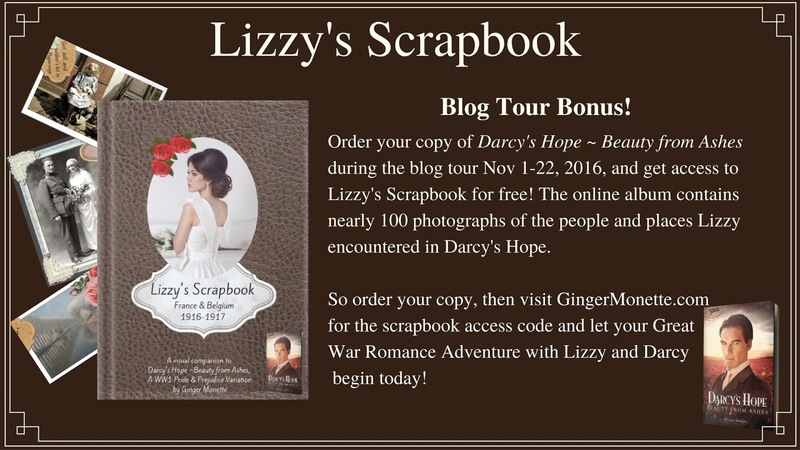 I hope everyone will take advantage of Lizzy's Scrapbook, the free bonus. It really helps immerse readers in the world and culture of the era. To access, simply purchase the book, then go to GingerMonette.com and follow the links to Lizzy's Scrapbook. And be sure to register for the giveaway! This story sounds really interesting. Can't wait to read it and see our beloved John T make an appearance. Loved the excerpt-oh! If Lizzy had received the letter!! As Ginger says, folk should definitely take advantage of Lizzy's Scrapbook once they've bought the book. It's a fascinating insight into the life of those involved in WWI, especially if don't know a great deal about the subject. Thank you, J.W. And thanks to everyone who has posted a review! It means the world to me and makes all the difference in helping others find Darcy's Hope. Lovely excerpt. Look forward to this read. Congratulations. I definitely plan to pick this one up. That excerpt sure hints at lots of unfinished business. I have the book to read on my Kindle but it will have to wait for another week or so! I am so looking forward to it! Each excerpt I read has me more and more intrigued. I loved this book and am anxious for the sequel. I was fortunate to read an ARC but with all the reviews I know that this is one I would have snapped up. The scrapbook is very touching. I deeply admire and respect all men and women who serve at home or abroad. This book is amazing, I couldn't put it down Now I'm waiting for the sequel. The scrapbook is so beautiful, that I've looked through it multiple times.